The corrosion testing/electrochemistry laboratory at Surface Science Western is very well equipped to handle a variety of corrosion testing needs. Our corrosion group is actively pursuing several short-term and long-term projects involving the examination of corrosion failures from field service materials with the objective of determining the root cause of the corrosion mechanism responsible for the failure of the component. 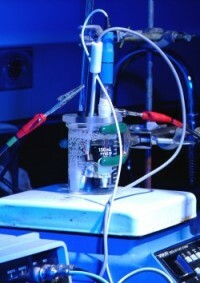 In addition, the electrochemical techniques available in the corrosion laboratory can be used to determine the following: 1) the corrosion rate in the metal/electrolyte system of interest, 2) the diffusion kinetics of ions in the vicinity of the corrosion processes, and 3) the quality of protective coatings. The current long-term research projects are sponsored by industrial partners and range from one to three years in duration.